There aren’t many living rooms as instantly familiar as the one belonging to the Simpsons family. And while much has changed since they first appeared on screen, the décor of that room in the opening credits has remained the same. The design style is intentionally simple and understated, reflecting the premise that the Simpsons could be any blue-collar American family. But what might their living room look like with a makeover? From the high glamor of Hollywood regency to the raw and rustic industrial feel, we’ve re-imagined it in six unique styles that might just provide the inspiration you need for your own living space. 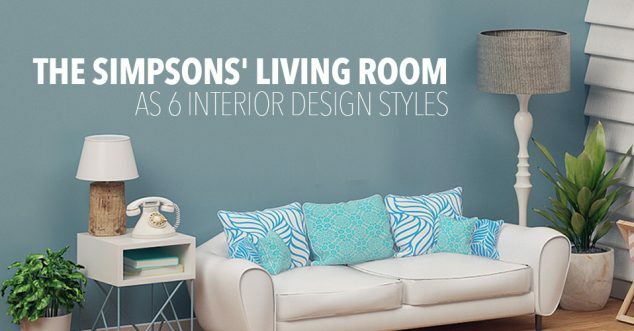 As a power plant employee, Homer would feel right at home in an industrial living room. It’s all about exposed brickwork, wood, and metal, which offer the room a rustic yet stylish feel. Ornamental abstract art, simple but elegant light fixtures and grey paint tones finish off the space perfectly. The Simpsons don’t live by the sea, but that’s never stopped anyone from celebrating all things nautical. Shades of blues and whites are the primary colors to use in this style. Seaside accessories like oars and shells are essential, while a shiplap accent wall gives the room a light and airy feel. If anyone in the Simpsons household would embrace bohemian decor, it’s Lisa. Vintage furniture, exotic rugs and decorations from around the world are the key features of this style. The ‘boho’ lifestyle is about being carefree and adventurous, perhaps summed up best by rich, vibrant colors and a purposefully messy layout. Marge probably wouldn’t like the chaos of a bohemian living room, but she and Lisa could compromise on the softer, more feminine flea market aesthetic of shabby chic. This style is all about mixing and matching finishes, colors and styles. Vintage furniture, wall hangings and floral accessories would give the Simpsons’ living room a more stylish – though equally casual – feel. A Hollywood regency living room redesign would make the Simpsons the talk of the town. This style is all about glamor and sophistication (not words normally applied to Homer and Bart), with contrasting color combinations like pink and green or turquoise and lemon. Opt for bold statement pieces like black furniture with gold accents, complemented by luxurious fabrics. You can get away with this decor in Hollywood, but how about in Springfield? The Simpsons have been on our screens for 30 years but if they were a bit older, their living room may have been designed in a mid-century modern style. Functionality is key here, with a taste of minimalism but a more colorful palette than you’d find in true minimalist design. Mustard yellow, green and even carnation pink are popular choices. Clean lines and sleek furniture tie everything together. If The Simpsons creators ever decide to shake up the design of that world-famous living room, any of these would be great options. But which one best suits your family? I love all of these as fresh takes on the Simpson’s living room. I do think it would have been nice to see their original recreated in the same style for comparison, even though we are all so familiar with it, we have not seen it in three dimensions often. The industrial suits Honer and Bart, but I don’t think Marge would appreciate Maggie being exposed to that “dirty” brickwork. The Bohemian is definitely Lisa, and I think Bart and Homer would enjoy it too, but the clutter may bother Marge. I think all three girls would like the soft, comfy shabby chic,but it would drive the boys nuts, and Marge is too practical for all that white. The Hollywood Regency is something I can only see after the kids leave and Homer retires, and again, I think it has too much white for Marge. I think the whole family would enjoy the simplicity and comfort of the nid-century modern, though, a classic look for a classic family. I see a lot of elements in each of these that I would be interested in putting into my own designs. Thanks for sharing a fun exercise!